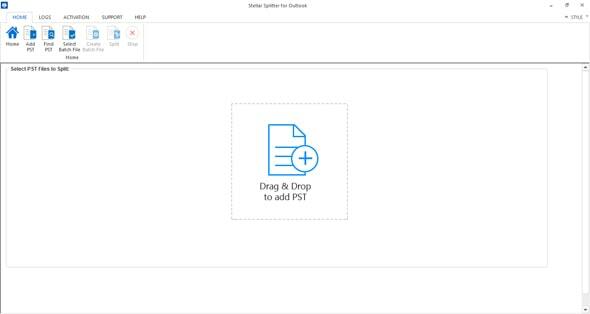 Outlook creates PST file to take backup of stored database in the desktop along with all the email items as sub folders. With time the size of this PST file keeps on increasing that make Outlook fail to perform multiple tasks start causing issues like slow down, hang, etc. An Archive is like a traditional backup way in which a copy of the original database is created moved to a separate Outlook Data File and can be accessed when required. The time duration to archive Outlook mails is dependent upon the use of email like monthly, quarterly, or even yearly. Here, we will discuss about steps to perform email archiving in Outlook. In this process you can move all the email into an archive .pst file. To initiate the archiving process, go to 'File' tab from the menu select 'Account Information'. An Account Information screen will open, select 'Cleanup Tools' button and choose 'Archive…' option from the drop-down menu. Next, you will be able to view an archive dialog box. Here select 'Archive this folder and all subfolders', and select a folder that you want to archive. For example, to archive you entire emails, select the top node. Now, select the option 'Archive items older than' from the drop-down list. The next popup prompts a calendar to choose a date in the current month by selecting a data.The resulted archived items will be older than the selected date. In case you are using Auto Archive option and want to add the items, which are not included in the process, then select the 'Include items with "Auto Archive" checked' check box. (This Auto Archiv eworks similarly to create Archive Outlook 2013 and Archive Outlook 2010). Now, after successful archiving process, you need to click on 'Browse' button if you do not want to save your file in the default location and specify a desired pathand the name to save of the archived file and click OK. Your archived .pst file will be saved to the predefined location. Remember, after the whole process your archived email messages will be no longer available in the main .pst file. Usually, this archived .pst file is automatically available in Outlook but in case it doesn't, then select the 'File' tab and on the left side of the 'Account Information' screen, choose 'Open & Export'.Click 'Open Outlook Data File.' on the 'Open' screen. A new dialog box opens, navigate to the location where you have saved the recently archived .pst file, select it, and click OK.Now, in the left pane of the main Outlook Mail window, you will be able to view a section named 'Archives' where all the archived email will be available. Note: Remember, when you archive Outlook your email into another PST file, the selected emails will be removed from the main PST file, that means they will be no longer available in your main PST. Archived files become inaccessible through Outlook Web App (OWA). The manual process do not create copies, instead it moves the archived mails from the original location due to which the created archived become the only place to access the emails. The manual process only provides single criteriafor PST management which is not beneficial for every user. It is difficult to manage the archived files as they become scattered over a certain period of time. 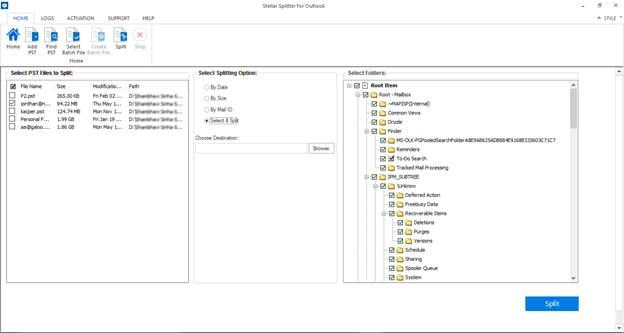 MS Outlook stores all user data (email messages, contacts, calendars, tasks, etc.) in Personal folders (PST) file. MS Outlook 2002 and prior versions confine the size of PST file to an upper limit of 2 GB. However, Outlook 2003 and later support the Unicode format that extends this size limit to 20 GB, with Outlook 2010 & 2013 supporting 50 GB. If the PST files approaches this upper limit, you may experience some peculiar Outlook behavior. You may fail to perform typical Outlook operations, such as sending or receiving an email, accessing different folders, moving an item to another folder, etc. In the worst cases, you might face an Outlook crash. "File has reached its maximum size"
In due course of time, your oversized PST file may get corrupt. In order to effectively overcome these problems, you need to split your large Outlook PST file into various smaller-sized PST files. These files will be independent of each other and can be accessed separately in MS Outlook. Microsoft Inc. provides the 'Pst2gb.exe' program that truncates a user-specified amount of data in the PST File. Sometimes, this oversized PST crop tool fails to work and creates a truncated copy of your PST File. In these situations, use Stellar Splitter for Outlook to crop efficiently or split a large PST file into smaller and manageable parts. 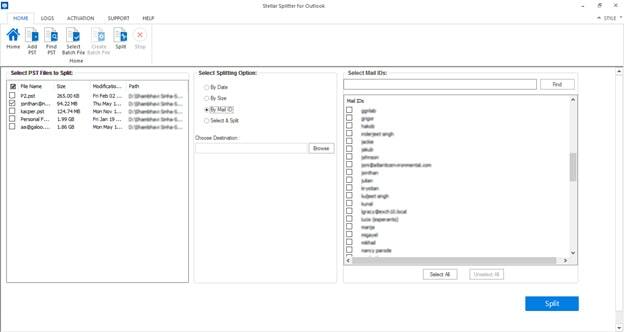 The main interface of Stellar Splitter for Outlook is shown below. It provides you two options: 'Split Single File' and 'Multiple Files'. Select the PST file using "Add PST" , "Find PST" , or by using "Drag and Drop" option. 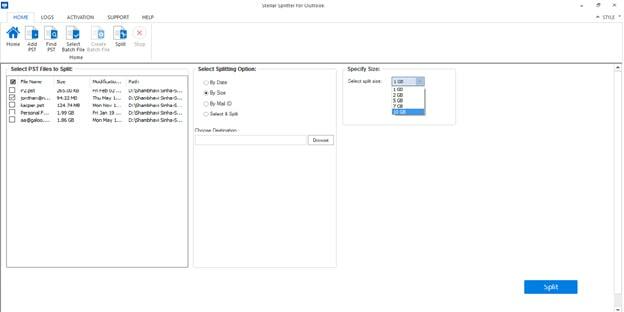 The next screen shows different splitting criteria, i.e. 'Date', 'Mail Id', 'Size', 'Select and Split'. 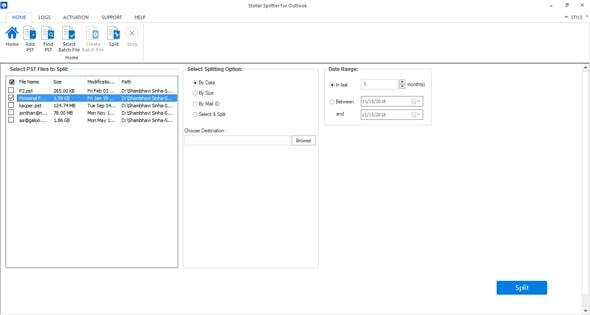 If you select 'By Date' option, you need to specify a preferred time duration to extract emails and other items falling within that period under 'Date Range. Select 'By Mail Id' and click 'OK' to start scanning the source PST file. After the scan is completed, a list of all mail ids in the file will be displayed. Now, select the desired mail ids on the basis of which the software will split the PST file. The software will scan the file and extract all emails having similar mail ids in the 'From', 'To', Cc, or 'Bcc' fields. Choose 'Select and Split' and Select the desired folders to be used as the split criteria and then click 'OK'. 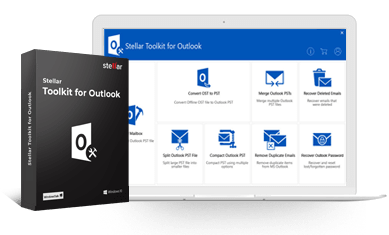 Stellar Splitter for Outlook is one simple and effective tool using which you can split a growing PST into small Outlook usable PSTs for later reference. Download the Free Demo of the software to see its features and functionalities.